After four decades of reform and opening-up, China has achieved great results. But arduous tasks lie ahead, so there can be no end to the hard work of reform. For instance, we have completed some of the reform tasks proposed by the central government since the 18th National Congress of the Communist Party of China. Yet, considering the goals, the remaining tasks are still heavy. The Third Plenary Session of the 18th CPC Central Committee set the goal of letting the market play the decisive role in allocating resources. But our achievements have fallen short of this requirement. Market unity, for example, is still compromised due to local government protection or industrial protection. As to openness, the market is still not equally open to Chinese companies, foreign companies and companies of different ownerships. Fair competition is another longstanding problem. A few years ago, the central authorities ordered that new policies should be subject to a fair competition review before being officially introduced. The requirement was also intended to cover existing policies, which could be canceled if they failed the review. However, the reality is that many new policies are still not in line with the principle of fair competition. Recently, some senior officials proposed to treat State-owned enterprises according to the principle of competitive neutrality to give private enterprises equal standing in the market and equal access to resources. This proposal triggered heated discussion. The OECD has drawn up many specific rules for achieving competitive neutrality, but despite much talk, China has a long way to go in implementing the competitive neutrality principle in line with the OECD's rules. So we can't be complacent about our achievements, as we face many remaining challenges. As for advancing reform, people from different industries and in different positions all need to make an effort. We also need to draw lessons from the past, which will make it easier for us to avoid repeating any deficiencies or mistakes. In the mid-1980s, our understanding of what a market economy should be then developed into a three-part theory of a planned commodity economy. The first part involves enterprises that run independently and assume sole responsibility for their profits and losses. The second is the competitive market system. The third is the macro-management system suitable for a commodity economy. At one point, some experts urged the use of indirect plans to control the market, which in turn would guide enterprises. We used to think that this might be another form of market economy, given certain special circumstances. But in retrospect, it seems that this was not the case. Although it seems like a market economy, considering that enterprises are guided by the market, the question remains: what is the status of the market? It's actually under the control of the State. Given the situation at the time, the Development Research Center of the State Council wrote a report suggesting that China should learn from Japan and South Korea, which used differentiated industrial policies. In other words, policies could be used to support some industries and enterprises while inhibiting others. Various policies, whether financial, fiscal or administrative, could be used to change the market, which in turn could guide enterprises according to government intentions. From an economic perspective, however, this way of influencing the market doesn't mean that the market actually plays a fundamental role in resource allocation. I seem to remember that current Chinese Vice Premier Liu He wrote an article many years ago, saying that this kind of differentiated industrial policy must be transformed into a market-friendly policy that promotes competition. Yet, there has been almost no change to the policy since then. Saying that we want to improve the nation's industrial policy doesn't mean changes will just happen naturally, because changes will require the establishment of a system that can really achieve market-clearing activity. 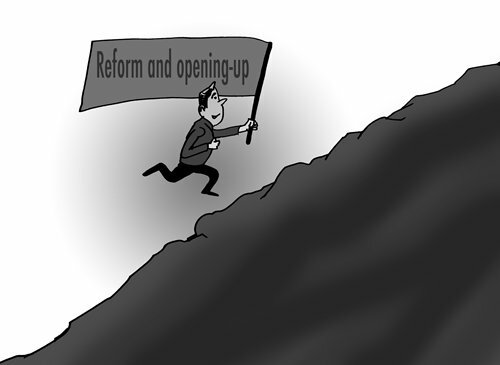 Looking back at the nation's reform history, a detailed analysis of the past will remind us of previous deficiencies and mistakes and help us with the current round of reform. Reflecting on the past will be conducive to further deepening reform and opening-up.